GracefullyVintage: Here fishy, fishy, fishy! These photos are from my weekly beach walk a fortnight ago. I have featured this fish themed playsuit two times previously on the blog already, it is one of my favourites so it seems natural to showcase it on the blog each summer. Fifi relaxing and Leo running towards the camera! My best little friends! I love everything about it and how comfy it is, I wear my swimsuit underneath just incase I decide to take a dip in the water. 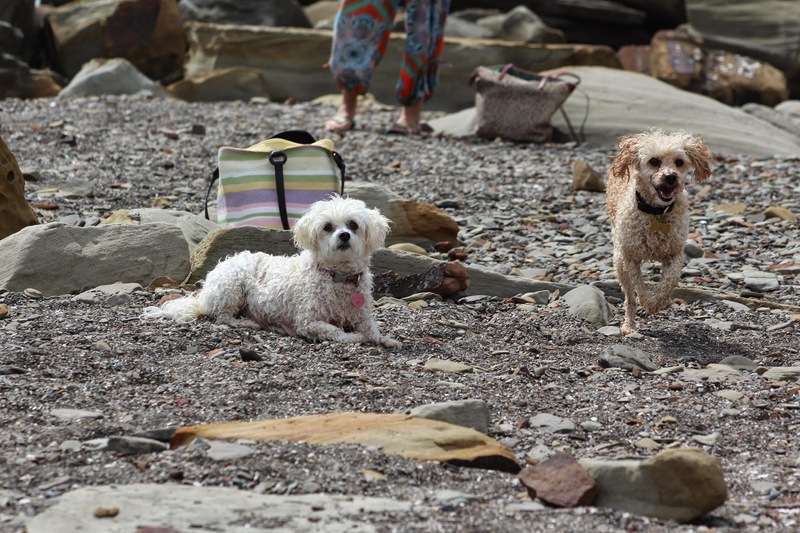 The dogs are so good, when my mum takes my blog photos at the beach they happily cool off in the water, sniff around the sand and play together. They don't mind waiting at all when they are at their favourite place. When we walk towards the beach-side shops after a walk and swim, Fifi loves to check out the stores and just be surrounded by people whilst saying hello to other dogs passing by with their owners. I love living in small beach towns, there is just something so relaxing about the atmosphere and people. Very very cute!! Lovely to see you are embracing the last bit of hot weather we're having! :) Your figure kills me every time!! Amazing! Sooo cute and fun!!! This has got to be one of the most charming, summertime perfect novelty prints I've seen in ages. It looks so great on you to boot, dear gal!